The ability of marine reserves to replenish fish stocks has been studied extensively, but evidence of their ability to benefit shallow-water communities to thrive remains a mystery. A team of scientists from the University of Miami (UM) Rosenstiel School of Marine & Atmospheric Science recently tested whether 10 years of reserve designation has translated into positive impacts on coral communities in Glover's Reef Marine Reserve, Belize. Results from their surveys of 87 patch reefs both inside and outside the marine reserve showed no clear indication of reserve implementation benefiting coral cover, colony size or the abundance of juvenile corals. The study, conducted by Brittany Huntington, Mandy Karnauskas and UM Professor Diego Lirman appears in the journal Coral Reefs. "We had hoped to find evidence of reserve protection benefiting the coral community as well as the fish community at Glover's Atoll. Unfortunately, the coral communities on protected reefs were in no better condition than the fished reefs," says Huntington. Rather, the scientists documented declines in the coral community both inside and outside of the marine reserve. These patterns of coral decline at Glover's Reef, including a shift in dominance from massive reef-building broadcasting species to smaller brooding species, and low numbers of juvenile corals were documented and seem reflective of regional patterns of coral decline in the Caribbean. The scientists detected no difference in herbivorous fish abundances or the abundance of macroalgae dominating the reef between reserve and fished sites. This provides a potential explanation for the lack of cascading effects on the coral community. 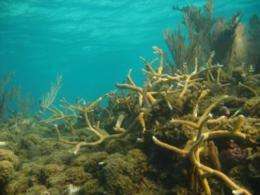 "The macroalgae is faster growing than corals, dominating the available free space on the reef and impeding coral growth and survival," said Huntington. "Without greater numbers of herbivorous fishes in the reserve to consume the macroalgae that is dominating these reefs, corals have little chance at recovery." The UM team also found that massive broadcasting coral species exhibited greater losses over time than their smaller-sized counterparts, suggesting that local management actions have not alleviated the trend of high mortality for these species. "Glover's Marine Reserve provides a unique opportunity to learn more about how marine reserves impact coral and fish populations," says Karnauskas. "Reserves that are not designed and implemented specifically for the protection of the coral community may fail to provide benefits to these species."